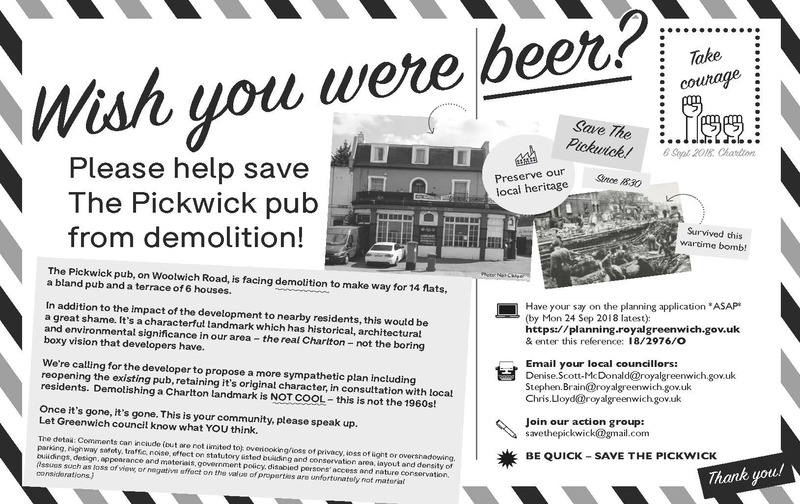 Following the news of a planning application to demolish the Pickwick pub on Woolwich Road in Charlton and replace it with a new pub, 14 flats, and six houses, campaigners are asking residents to raise objections to the developer’s plans. Citing the “historical, architectural and environmental” significance of the pub, the Save the Pickwick campaign is calling on the developer to retain and reopen the pub in consultation with local residents, rather than demolish it and replace it with a ‘bland pub’. The deadline for comments on the Pickwick planning application is Monday 24 September. To see the full application and make comments, visit planning.royalgreenwich.gov.uk and enter reference 18/2976/O. Comments on the application can also be sent to Peninsula ward councillors. To get involved or contact the campaign, email savethepickwick [at] gmail.com. Plans to demolish another historic Charlton pub, The White Horse , were refused on appeal by a planning inspector in 2015. Now a developer is trying to build an extension and convert its hotel accommodation into bedsits. To comment on this, visit planning.royalgreenwich.gov.uk and enter reference 18/2735/F – the deadline for that is Wednesday 26 September. Comments can also be sent to Woolwich Riverside councillors. 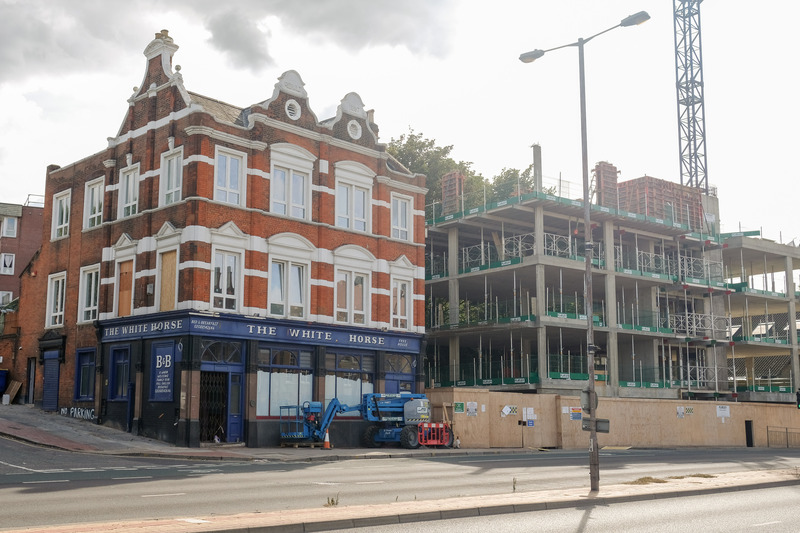 What’s happening to the derelict Victoria pub on Woolwich Road? Out exploring the industrial land that is set to become Charlton Riverside (see the latest on that planning saga here) we took the opportunity to take some new photos of the decaying Victoria pub, which prompted a lot of questions on our Twitter and Facebook channels about its current status and future. It’s in a poor state. With a reputation for having been a pub with a lean, it now appears to be falling backwards down the hill. Added to that, much of the back of the building is missing, and it’s clearly not been watertight for a long time. There is an outstanding planning application – reported by From The Murky Depths blog around this time last year – to restore the pub, turn it into a takeaway, and build new accommodation at the back. It’s not clear what is happening with this application at the moment. Land Registry records show that the building is currently owned by a Jahangir Ghani, who bought it in July 2014 for £380,000. Unhelpfully, the owner’s address is given as the pub, though there’s clearly no one living there at the moment. The building is included in Greenwich Council’s list of Buildings of Local Architectural or Historic Interest – the ‘local list’: “Late Victorian public house with Edwardian tiled façade by Truman’s Brewery. 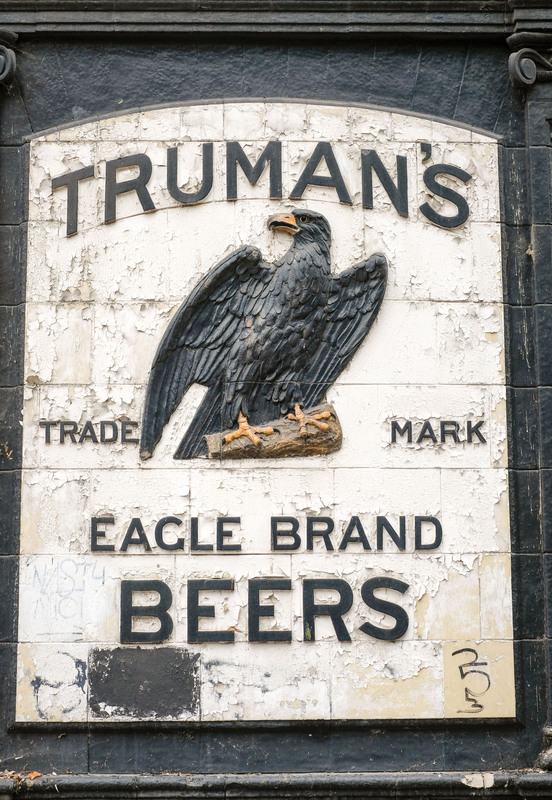 Despite fire-damaged interiors the fine tiled façade of 1910 survives with several splendid features including the large spread eagle which holds up the corner above the name ‘The Victoria’ and Truman’s trademark eagle on the Eastmoor Street façade. Significant townscape value being the only remaining building marking former historic crossroads of Eastmoor Street 107 of 132 Woolwich Road which gives a sense of the now lost, formerly intimate streetscape of the area. Qualifies due to architectural interest as an evocative and sole-surviving example and environmental significance as a characterful, time-honoured local feature. Forms part of the Thames Barrier and Bowater Road Conservation Area” . 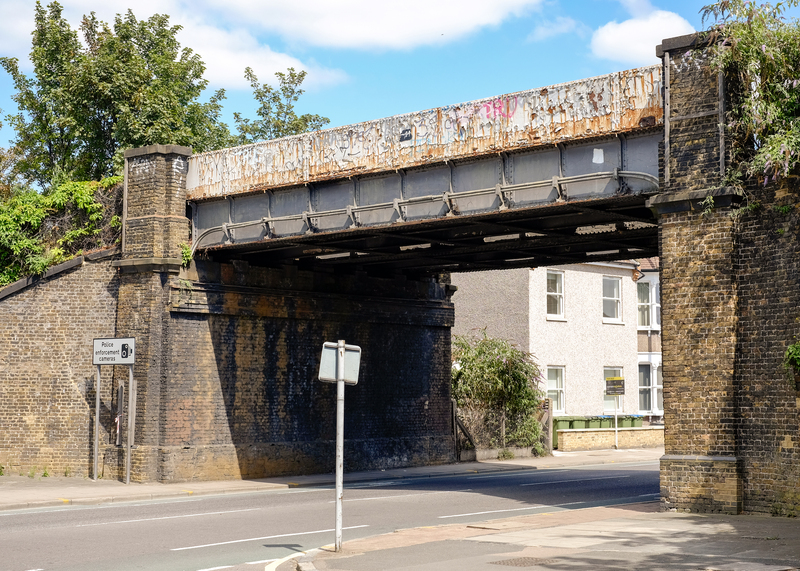 It is important to note that a local listing does not offer the same protection as a national listing in planning terms; find out more about listed buildings in Greenwich here. Do you know any more about the plans for the pub? Get in touch and tell us what’s going on! And we’d love to hear your memories of the pub when it was open in the comment section below.